It is a well-known fact that a happy and motivated workforce is less likely to take time off work and more likely to remain productive throughout the day. In the first blog post by Relay Floor Systems, we discuss the health benefits of introducing anti-fatigue mats to your workplace, and the small things staff members can be encouraged to do throughout the day to ensure their own comfort and safety. If you or you or your staff members stand up throughout the day, keep reading. The type of flooring used throughout your business premises is typically dictated by the type of work being carried out, meaning that a more comfortable carpet isn’t always an option. 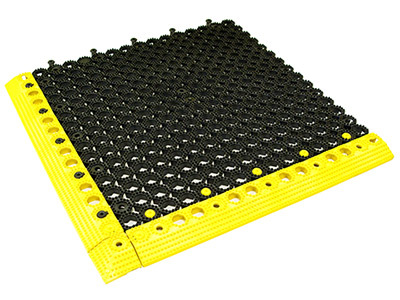 However, the introduction of anti-fatigue matting could make all the difference. Anti-fatigue mats are made of a softer compound than hard flooring, which encourages subtle movements of the calf and leg muscles. Consequently, this movement promotes good circulation, reducing the fatigue felt by workers. In some workplaces, standing is not only compulsory, it is also a necessary part of the job. However, alongside investing in tailored anti-fatigue mats, there are a wide variety of other things you can implement to reduce the pain and fatigue that can be felt by standing on hard substrates all day. If you must stand at work, consider using a small step or bar stall to rest one foot on throughout the day. The frequent change of movement and positions will encourage a slight weight shift, ensuring relieving the muscles of the continuous pressure of standing in one position. Some workplaces will provide their staff members with suitable footwear, in line with the job being carried out. However, if you wear your own footwear to work, consider adding orthopaedic inserts to reduce to stress on your feet, legs and back. Another top tip is to alternate your work shoes, giving your feet a slightly different position each time you change them. Here at Relay Floor Systems, we have been providing a wide variety of commercial and industrial flooring solutions for many years. If you would like more information on our wide range of services, please contact us today on 01543 258889, alternatively, fill out our online contact form and we’ll be in touch shortly.